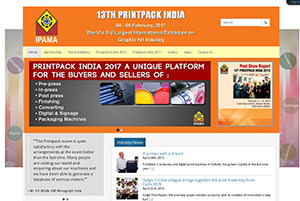 Printpack India 2015 was the biggest printing & packaging show. It turned out to be a mini world show on the graphic art industry. We have done the online promotion for this events including the creation of their website, marketing over the different social media portal, marketing via emails and a new marketing technology i.e. whatsapp marketing. All this results in more than 1,00,000 visitors. People from the 150 different countries viewed the portal and we also helped in generating various serious business enquiries.